Most choose these lifestyles for ethical and environmental reasons, but whether you’ve made this your official lifestyle choice or are simply doing your best to avoid animal products, VitaMist has an easy way of helping you ensure that you stick to your lifestyle goals and avoid potentially health-damaging vitamin deficiencies. Plantbased/Flexitarian/[Insert Trendy Name Here] overall revolves around plant foods with some or minimal meat and animal products. Meat. Was that a little too obvious? Your body needs a sufficient supply of protein and fats (Yes, fats are very healthy. Don’t let the name fool you.) to replace what you’ve lost by cutting out meat and eggs. In fact, if you don’t get enough protein and fat, you’ll find yourself craving not just meat, but everything. Proteins and fats both take more time to digest, so they provide the sense of being full for much longer. Be sure to replace them with a variety of lentils, beans, nuts, oils, etc. Don’t just cling to soy and olive oil, either. A variety of protein sources will not only be healthier, but will prevent boredom with your new diet. A quick culinary tip before we move on: Mixing different fats, such as canola and olive oil, makes your whole meal taste better. It’s that variety of different fatty acids. Your body loves variety in its diet, and your taste buds do to. Vegetarians and those who don’t go ‘full vegan’ will have it a lot easier than those who cut out dairy entirely. Milk products contain the protein casein, which breaks down into casomorphins during digestion. If that ‘morphin’ at the end of casomorphin raises your eyebrow, that’s because this chemical is actually a mild opiate. In addition, cheese contains phenylethylamine, which is similar to amphetamines. I learned these two crazy facts while writing this article, and it explained so much about my cheese cravings. We’ve already mentioned proteins and fats, but there are a lot of micronutrients that vegetarians and especially vegans need to watch out for. Trace Minerals. The importance of mineral supplements is often overlooked, despite the fact that roughly 95% of our body’s functions depend upon minerals. However, due to soil depletion and the loss of topsoil from flooding, over-irrigation, and deforestation, together with poor crop rotation, a significant proportion of the trace mineral content has been lost from today’s vegetable based food supply. Recommended Product: Minerals. Omega-3 & 6. Most omegas are consumed through fish, though it is also available extracted from vegan sources such as: spirulina, blue-green algae, and flaxseed. No need for fish or fish oil supplements to get your omegas. Recommended Product: Omega. 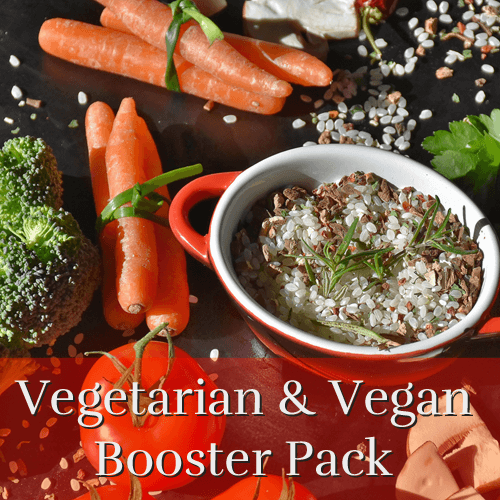 The Vegetarian & Vegan Booster Pack is geared towards replacing the nutrients that a plant-based diet lacks. The products in this pack include VitaMist’s Multiple, Minerals, C+Zinc, B12, and Omega. All for 20% off the cost of purchasing them individually.